Kabayan, new to Canada and have a work permit? You can apply for up to $250,000 in coverage. Call 780.807.4743 today and find out what CPP can do for you. MANILA (Philippines News Agency) — Doing away with history books and superhero comic books, where would you find a hero in this day and age? They are the silent and the humble who finish their jobs without much exaltation; they are all in our midst. The local street sweepers who keep the streets clean of trash. The soldiers who, with or without you knowing, are always on the watch for security threats and keep them at bay. The doctors, who, even with lack of sleep, tirelessly save lives. The teachers, who offer their time unconditionally to nurture their students. The firefighters who, without hesitation, will rescue anyone trapped inside a burning building. Or those overseas Filipino workers (OFWs) who are always regarded as the country’s “modern-day heroes” for the sacrifice they give to provide for their families and also keep the economy afloat. Whether one helps directly or indirectly, or save a thousand or a single person, anyone who helps promote the welfare of another is a hero — someone deserving of respect and gratitude. They are everywhere but you may not just recognize or acknowledge them. August 27 marks the Philippine National Heroes’ Day. It pays homage to countless heroes who fought for the country’s freedom. But this year, President Rodrigo Duterte particularly honored “ordinary Filipinos” whom he described as “everyday heroes” in the midst. Those who despite the challenges that come their way, continue to work for the well-being of their families and the advancement of the nation. One example of such hero is Rose Evangelista Reutirez, an ordinary OFW, like many others, working to provide a better future for her loved ones. Also a mother, which makes her extraordinary, Rose is determined to continue her almost 30-year work as a household service worker in Kuwait. Her seven-year-old kid is still in the first grade, still more than a decade away before graduating from college. “Kung kaya pa magtrabaho, patuloy ako para maka-ipon para sa anak ko. Sana lang laging malusog ang pangangatawan ko, awa ng Panginoon dahil lagi siyang nandiyan (As long as I can still work, I will continue so that I can provide for my child. I just hope that I’d always be in good health, but thanks to God. He’s always there),” she told the Philippine News Agency (PNA). While she gets to go home every two years, homesickness never fails to haunt her. “[Pero] kailangan. Pabalik-balik lang ako sa Kuwait kasi mahirap ang buhay sa atin at mahirap lang kami. Ako lang ang inaasahan ng pamilya ko, pati na ng anak ko (But it’s necessary. I always return to Kuwait because life in the Philippines is hard and we are poor. My family and my child depend on me),” she added. Rose went through a lot. Aside from missing her family and the daily grind she needs to go through, her sacrifices as an OFW maybe traced back during the Gulf War, when Iraq invaded and occupied Kuwait. Sometime in August 1990, Rose recalled hearing a volley of gunfire outside her employer’s home. “Wala ‘yong mga amo ko noon kasi nasa trabaho biglaan lang ‘yong uwi nila, and sabi sa akin mag-empake. Malapit pala sa bahay ‘yong bombahan at barilan (My employers are working at that time when they rushed home and told me to pack my stuff. It turned out the shelling and firefight were already near their home),” she narrated. Rose and her employers ran for safety and sought help from the latter’s friends. Without communication from the outside, she cannot seek help or runaway for fear of being kidnapped by the Iraqi soldiers. “Akala noon ng pamilya ko patay na ako kasi mahigit isang taon din wala akong komunikasyon sa kanila. Hindi naman ako makapunta saembassy kasi tinatakot ako ng amo ko noon, ayaw niya akong palabasin. Tinatakot ako noon na kukunin daw ako ng mga Iraqi tapos papatayin (My family thought I was dead because I lost contact with them for at least a year. But I can’t go to the embassy because my employers would scare me that I’ll be kidnapped then killed by the Iraqis),” she narrated. The war ended, but Rose and the same family lived for more than a year at the latter’s friend’s home. To make things worse, she didn’t receive any salary during that time, forcing her to juggle work for her employers. Rose was often locked up until one day, she escaped from her employers. “Mga one week ako sa embassy pagkatapos ‘kong tumakas, tapos kinuha na ako nila madam (I stayed for at least a week at the embassy before madam hired me),” she said. Since 1992, she worked for Roqaya Mohammad Deif, who had since employed other 10 Filipino household workers in her family, all of whom were treated well and humanely. Tags: Duterte on OFWs, OFW, OFW remittance, Overseas Filipino Worker. Bookmark the permalink. Cheers to Rose who is extremely brave in overcoming her ordeals and who did not stop fighting just so she can support her family. We often hear heartbreaking stories of OFWs especially in Arab countries. 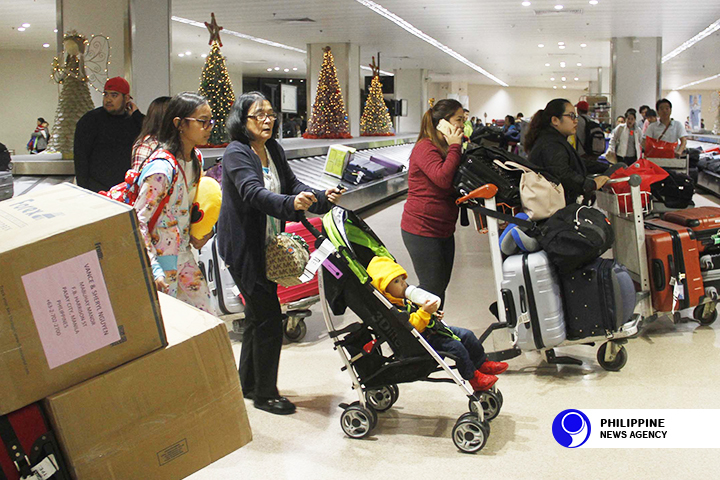 I just hope that families of OFWs realize the difficulties that their OFW relatives are undergoing and be appreciative of everything they do for them.